Who Needs Product Information Management (PIM)? We have discussed PIM’s role as a customer-facing system and how PIM can assist with the creation of effective product content but we haven’t addressed how a company knows when an investment in Product Information Management (PIM) technology makes sense. I believe the following chart is one way to address this question. What we see is that the need for a PIM is not merely a function of the number of SKUs your organization sells but is also influenced by, for instance, how they are sold, who is buying them and where they are sold. I have worked with an organization that had an active assortment of 4,000 SKUs that needed a PIM technology and a company with 25,000 SKUs that succeeded with more traditional item management systems. The difference between these 2 businesses was that one had a low SKU count but a global multi-channel footprint along with complex product and support requirements; the other had a larger SKU count but could easily consume syndicated product content for their single-channel drop ship business model. 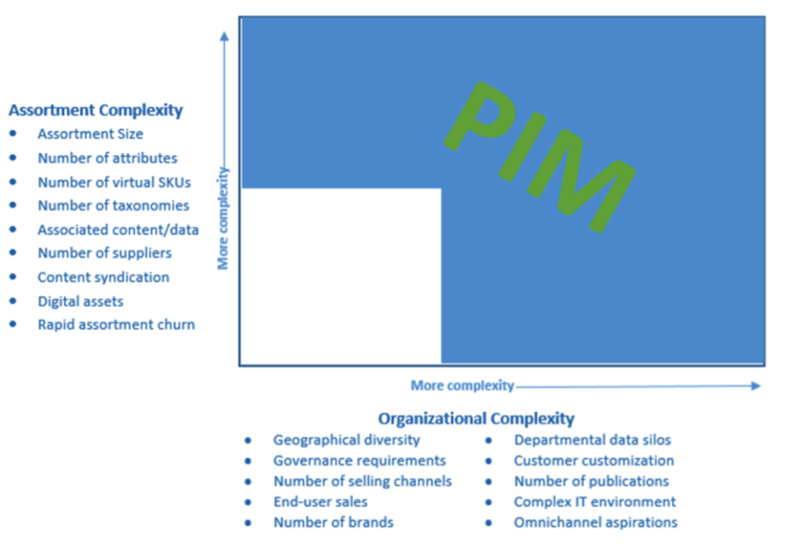 Assortment complexity is an obvious trigger for an organization to consider a PIM. Usually Assortment Complexity is quantified based on SKU count. This is a good metric especially if the SKU count starts to creep into six digits. However, SKU count is not just a measure of the static number of rows in your Item table but – perhaps more importantly – the amount of periodic change or ‘churn’ to the assortment. For example, a 500K item assortment that turns over 5% of its SKUs per year may be less complex than an 80K item assortment that swaps 30% of it SKUs per quarter. Assortments are more than SKUs and SKU attributes; they also encompass classification taxonomies, unstructured data such as images and related item data like cross-sells or upsells. For instance, a manufacturer who sells finished goods to resellers faces a much more complex environment when it decides to sell those same finished goods direct to consumers who will require more product information organized in user-friendly categories along with compelling product content. Additionally, the number of suppliers a retailer deals with also impacts the assortment complexity. Harmonizing similar and sometimes identical products from multiple sources and suppliers can be time consuming if not impossible without a proper tool set. Furthermore, as more and more companies embrace the concept of endless aisles, the amount of virtual SKUs increase dramatically therefore adding another dimension of assortment complexity not only in SKU count but also in product information flow and management process. PIM is particularly adept at simplifying the work associated with maintaining complex assortments. Organization complexity and processes should not be overlooked when considering a PIM investment. Moving an item from a notion in a buyer’s head to a product purchased by a customer requires a number of interactions and steps at most companies. These processes increase in complexity when geographical diversity generates localization requirements or when a new selling channel – such as the DTC example above – adds new factors and business rules to existing organizations. Omni-channel selling requires content consistency across all customer touch points, which is a core PIM competency. B2B customization – e.g., propriety item identifiers or taxonomies – are also much more easily enabled by PIM. In addition, the higher number of content consumption channels you have and the more complex an IT environment there is, the more likely you will need to consider a PIM. Look to PIM if your organization is beset with important item data trapped in private Excel or Access databases. Product data is too important to your organization to be lost or trapped on an individual computer. We’ve seen that PIM is a customer-facing system that provides technology that will enable effective and compelling product information for your customers. We’ve also discussed some signals and criteria you can use to determine if PIM is a solution your organization should embrace. Finally we examined how PIM can address business challenges that your growing organization may be facing or will face in the future. Tim Toews was Global CIO of Office Depot from 2005-2010, responsible for IT strategy and execution for the Fortune 200 Retailer. Prior to 2005 Tim was International CIO for Office Depot and led the company through some of its most pivotal transitions, including its entry into non-US markets and the launch of its B2C eCommerce business in 1998. In 1996, Tim’s team at Office Depot deployed one of the first transactional B2B web sites. He left the company in 2011 after leading the launch of a pure-play eCommerce brand in the United States. Prior to joining Office Depot, Tim was a partner at a retail consulting firm for 10 years. Tim has senior level, across-the-board experience in B2B, B2C, multichannel and international management while maintaining a hands-on approach to business, operations and technology problem-solving. Currently, Tim is consulting to a variety of companies on technology strategy, platform selection and organization design. Tim has a BA in Political Science from the University of Southern California and studied for his MBA at UCLA.